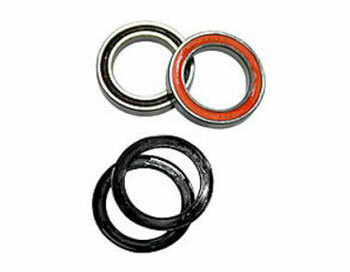 Genuine replacement bearings for the new style Campagnolo Ultra Torque chainsets, including seals. A gentle, yet effective cleaner which removes dirt, oils and airborne contaminates without stripping the durable water repellency coating from technical clothing. Easy spray on XT spray on waterproofer restores the durable water repllency on garments back to their original levels of performance. The world's first energy efficient single wash cleaner and proofer. CNC machined alloy valve extenders for deep and semi deep section rims where the valve length is insufficient. Available in 2 lengths: 72mm & 48mm. Traditional mudguard construction dictates a sturdy design, with bolted fixing at the brake bridges, and metal or rigid plastic utilised in the main arc. This principle has remained unchanged for a century or more. The Crud 'Roadracer' concept turns orthodox road mudguard design on its head. Crud reasoned that if you could 'float' the mudguard off the rim,then you could do away with a lot of the traditional fixings. The ultralight 'Roadracer' mudguard (180g pair) just hovers in place, so there is nothing to rattle or rub. The brushes instantly dampen any road vibrations, settling the mudguard into its neutral central position. These very easy to fit mudguards are ideal for road bikes without sufficient clearance to accomodate full length mudguards. Supplied with stainless steel stays and fully adjustable fittings (No drill required! ), they are compatible with 700 x 20to 26c tyres and available with a silver chromo-tec or sleek carbon effect finish. 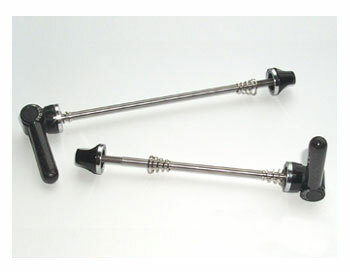 Lightweight skewer set to enhance the look of any race or MTB cycle. As well as making a substantial weight saving over standard skewers sets the levers are finished in carbon fibre to give a classy expensive look. Altura speed seatpacks use a multi panel, pre-shaped construction to give a super neat fit with enough space for trail or road essentials. 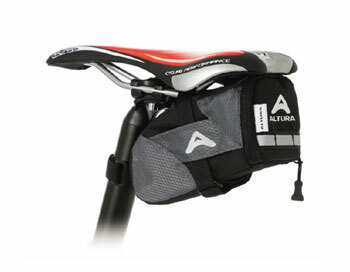 Altura trail seatpacks are ideal for leisure, trail and road use. They combine a large volume with durable materials. Customised Cork Plus tape for race handlebars. Made in Italy with the Quest brand logo embossed along it's length. 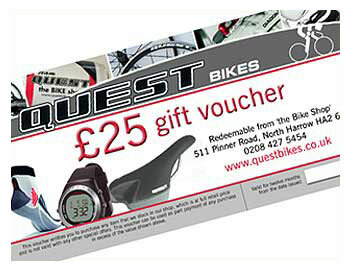 This high quality tape is the perfect finishing touch for all Quest bike or handlebars. Available in Red, Blue, Black or White. Customised Cork Plus tape for race handlebars. Made in Italy with the Pinarello brand logo embossed along it's length. 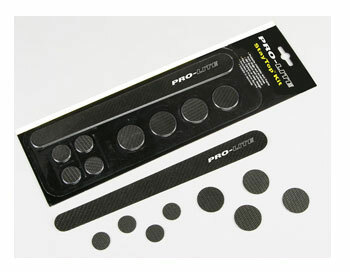 This high quality tape is the perfect finishing touch for all Pinarello bike or handlebars. 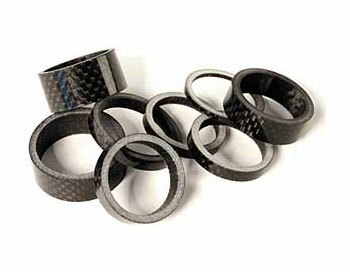 Self adhesive chainstay protector with hard wearing carbon effect finish. Flexible enough to fit any shape chainstay. Self adhesive carbon paintwork protection patches in hard wearing carbon fibre affect. Made to fit along the RH chainstay and where cables rest against the frame's paintwiork. 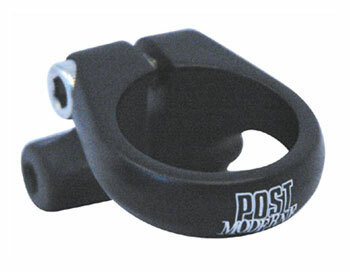 Super light seat post clamp for any frame with external seat tube diameter of 31.8mm. CNC Machined from 7075 series alloy and supplied with a titanium bolt producing the lightest seat clamp we have ever seen! Just 8gms! Ideal finishing touch for any Quest frameset. 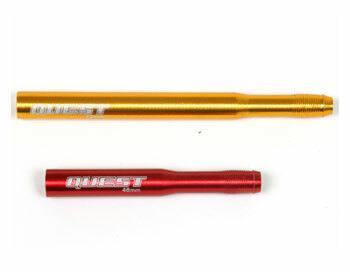 Laser etched with the Quest logo and designed to keep any seatpost tight in it's correct position. 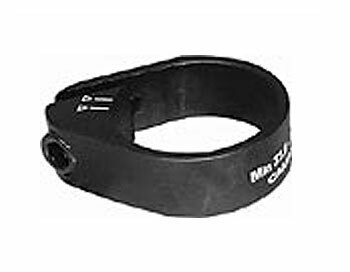 Alloy seat clamp with 31.8mm internal diameter that will fit most alloy road frames. Rear lugs will accept the top mounts of most rear carriers making it perfect for those wanting to fit a carrier to any farme that does not have the lugs. Highly recommended for the "Quest Audax" frameset. 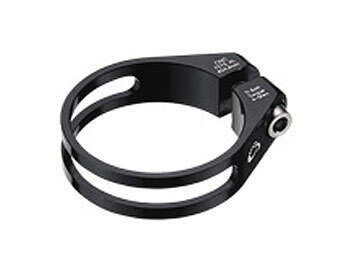 The Campagnolo seatpost clamp uses an asymmetrical clamp to relieve stress on carbon or any seatpost. The asymmetrical design of the Campagnolo clamp and the proximity of the locking screw to the seat tube are intended to prevent damage. 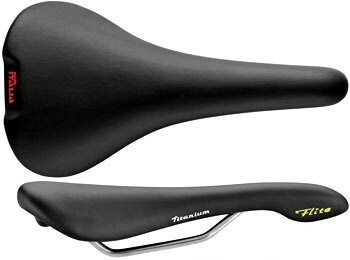 This smart and simple design decreases irregular pressure on the circumference of the seat post and ensures uniform band pressure over the entire circumference of the tube. 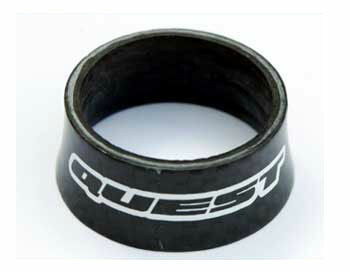 To fit 31.8mm outside seat tube diameter.